Upcoming Japanese action role-playing game Nier is getting an English language comic book. How does it compare to the original Japanese art? They're...different. It's not a matter of which one is better or worse. 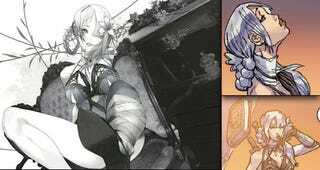 Here are two different stylistic takes on Nier by accomplished artists. On the right is the Western comic art. On the left is the Japanese art. They are different. DC Comics' Wildstorm imprint is creating a three-part online comic that will feature the work of top DC Comics talent. Contributors like Ricardo Sanchez, Pop Mhan, Eddie Nunez, and Carlos D'Anda will help flesh out the Nier universe. Here is how Kainé is depicted — both Japanese and Western versions. And this is the game's protagonist, Nier.